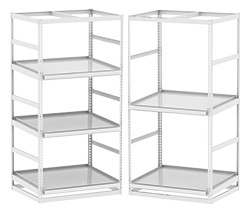 With angled tiers and space for a lighting system, this steel shelving enables you to grow your operation upward and make your floor space the most productive and profitable it can be. The top frame is designed with the latest lighting technology in mind and offers multiple points for hanging lights (not included). Perfect for top feed irrigation systems, the adjustable shelves feature 2-inch front troughs with open ends to accommodate PVC drains, and optional caps allow you to add drainage tubes directly to the trough. The antimicrobial finish helps you manage threats to your crops, and the unit assembles easily with minimal tools required to get you growing in no time.